In this two-part feature, Matt Maguire talks to Sledgehammer Games about how they are meeting the challenge of pushing the Call of Duty franchise forward into a new generation. We’ve only just settled into leather La-Z-Boys at the back of Sledgehammer Games’ in-studio theatre in Foster City, California, but Chris Stone is already swinging for the fences. 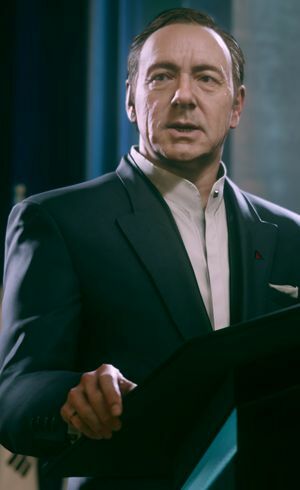 “We set a goal early that we wanted the best looking characters not just in Call of Duty, but in games,” says the Advanced Warfare animation director. To achieve such a lofty objective, Sledgehammer is using a new engine built almost entirely from scratch. It includes new rendering, animation, physics, and audio systems, and has dramatically changed the way Sledgehammer develops games. The most obvious change was in the performance capture department. “Traditional performance capture is flawed,” contends Stone. “You have guys on a stage and cameras 100 feet away from them trying to pick up the location of a tiny mark.” On top of that, the old approach of using dots on actor’s faces tends to give a slightly unnatural, wooden look due to the limited data being gathered, he adds. As such, Sledgehammer worked with the team at Giant Studios that helped bring Gollum to life for Weta in order to do get similarly impressive results with its digital soldiers. That meant no dots, and getting up close and personal with the actors. “We put this high-definition camera two inches from this person’s face, we’re not missing anything,” Stone explains. “Every little bit of motion, the intricacies of every expression – we get it all. “So when you see Jonathan doing a smile or a sneer, it’s not just us trying to interpret that expression, that is his expression, the exact expression he would make for that delivery.” This footage was augmented with scans of the muscles in each actor’s face, and likenesses were built from there. Each actor was filmed forming different expressions for the cameras and initially, 75 scans of each face was used. Once Sledgehammer realised what it could do with the scans, it found it needed more and more and more. The word ‘photorealistic’ is even mentioned a few times in our studio tour, and that’s a standard that’s not too distant from what Sledgehammer believes it has achieved. “There are shots in our game that if you printed it out, I would challenge you to be able to separate which is a photograph and which is not – it’s pretty spot-on,” says Sledgehammer co-founder and head of development Michael Condrey. "As we started shooting, it became obvious that Spacey can bring a little more than what we pictured to a performance. The second or third shoot he really dialled it in." Despite having worked with Marlon Brando for The Godfather game (whose sickly performance was eventually replaced), Stone was anxious about ordering Spacey around. “The last thing I wanna do is walk onto a p-cap stage with an Academy Award-winning actor and tell him exactly what to do,” he says with a laugh. “He’s going to bring a lot more to this performance than I can probably give him.” During the first few shoots, Spacey and the team bounced ideas off one another, but sure enough, the actor soon made the role his own. “We went into the performance capture sessions for Irons [Spacey’s character] with a really good idea of what we wanted this character to be,” says Stone. “As we started shooting, it became obvious that Spacey can bring a little more than what we pictured to a performance. The second or third shoot he really dialled it in.” There was even a House of Cards executive producer sitting on on the shoot for some scenes, and the distinctions between Irons and Frank Underwood (Spacey’s House of Cards character) were discussed. It wasn’t all nuance, though. The guy who did the rigging for Man of Steel and Iron Man set up all the wire work for action capture shoots Stone calls as “a lot of fun and definitely a new avenue for games”. That rigging allowed the studio to properly emulate the effects of the game’s Exo-Suits, and allowed actors to “kick dudes 40 feet or whatever”, says Stone with a grin. One session only came to an end when director James Cameron finally kicked Sledgehammer off the sound stage so he could film Avatar 2. 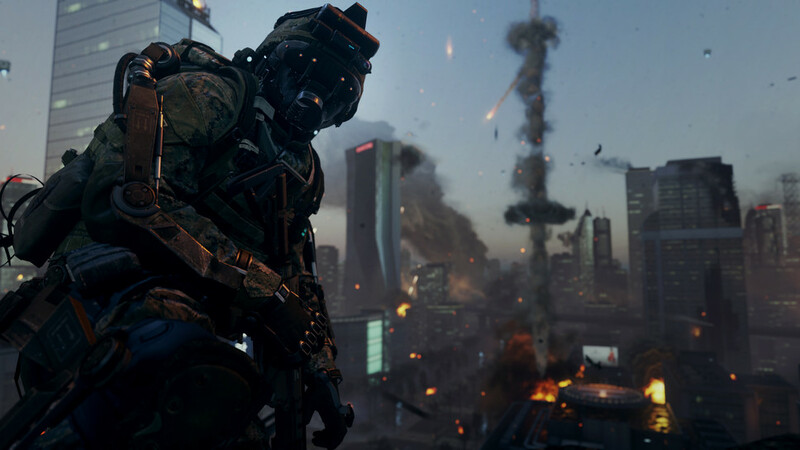 Film has had a large impact on Advanced Warfare’s sound design. “We wanted a clean, focussed mix like you see in a movie,” says audio director Don Veca. He refers to the way that the camera’s focus in film is always higher in the mix, with other noises in a scene somewhat muted. “Of course, in a movie you know what’s going to happen and can adjust the mix,” Veca adds. It took the creation of a new audio engine to get that happening in real time for Advanced Warfare. Lead sound designer Dave Swinson chased a garbage truck down the street in his pyjamas to record the whine of its mechanical arms. The sound design itself took place in specialised ‘floating’ rooms decoupled from the rest of the studio’s building – isolated to prevent sound transfer muddying things up. In these small octagon-shaped rooms, the sound team was able to concoct audio that outputs with a greater dynamic range than prior Call of Duty games thanks to the greater storage space available on new-gen consoles. For the game’s distinctive Warbird ship, that meant mixing recordings of jets and helicopters together, then adding layers of synthetic sounds. For its huge robot Walkers, lead sound designer Dave Swinson chased a garbage truck down the street in his pyjamas to record the whine of its mechanical arms. The sound made when the Exo Shield deploys is actually 20 tracks layered one on top of the other, one of which is a door being slammed. When it first set up shop in Foster City, Sledgehammer Games was sharing a floor of its nondescript East Hillsdale Boulevard office with another business. When the developer was shoulder-tapped for what would become Advanced Warfare, expansion was on the cards, and as the story goes, the staff took to the internal wall dividing the neighbouring businesses with sledgehammers, eventually emerging from clouds of plaster having successfully doubled the studio's space. It's an amusing legend, and one that's fitting not only because of the studio's name, but also because it can be seen as a metaphor for the development of Advanced Warfare itself: hard graft, mess, and the breaking down of systems to create something bigger and better. There’s certainly no doubt the Call of Duty franchise was in need of a serious overhaul. Precise figures are hard to come by, but the consensus online is that last year’s Ghosts was the lowest-selling Call of Duty title since 2008’s World at War. Of course, no-one was more aware of this than Sledgehammer itself, so instead of an update, the game got a complete rebuild: a new engine, new animation, and new audio. Technical advancements do not themselves a great game make, but in this case they are powering brand new gameplay mechanics made possible by the addition of the Exo-Suit – a feature which singlehandedly “redefines how you’re going to play COD” according to Condrey. Every Call of Duty title lands with a mountain of hype, and this year's title will be no different. But for the first time in a long time, it feels like serious risks have been taken with most facets of the franchise. So don't blink, because after three years of toil, Sledgehammer Games is finally at the plate. And when you swing for the fences, every now and then you hit one out of the park. 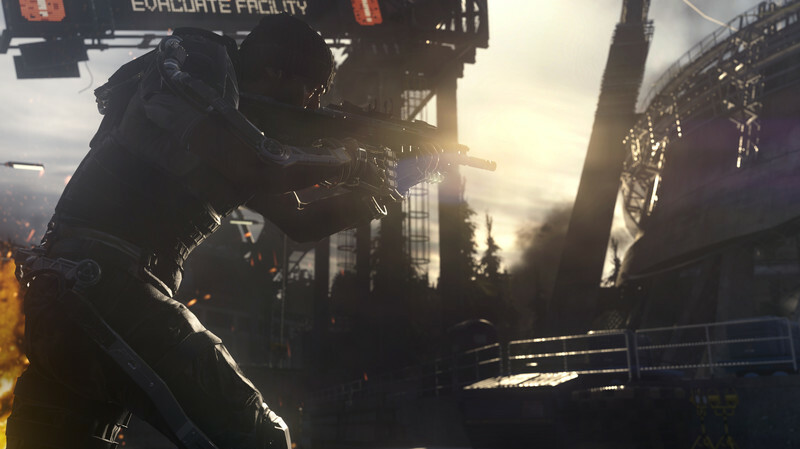 Call of Duty: Advanced Warfare is coming to Xbox 360, Xbox One, PlayStation 3, PlayStation 4, and Windows PC on November 4.